The youngest ever Commonwealth Games medal winner has been told she is no longer disabled enough to compete in the 2016 Paralympics in Rio. Erraid Davies from Shetland, also the youngest ever competitor when she won bronze in the women's 100m breaststroke final aged just 13, has had her classification renewed by medics. Erraid has Perthes disease which affects her hip bones and joints. The teenager must now await a second opinion. Medical specialists in Glasgow said her physical impairment was no longer severe enough to allow her to compete in a disabled event. This stops her from taking part in the upcoming British Para Swimming International Meet, which is part of the qualifying process for Rio. Erraid will be examined again by a different set of specialists in the coming weeks to see if they uphold the decision. She was first taken swimming by her parents at the age of four, and her parents said her condition meant she could barely walk. Erraid's huge smile upon realising she had won made her one of the iconic figures of the 2014 Commonwealth Games in Glasgow. A spokeswoman for Scottish Swimming said: "In line with IPC classification process, Erraid Davies of Delting Dolphins in Shetland, undertook a classification review at Tollcross International Swimming Centre, and has been deemed ineligible to compete in the forthcoming British Para Swimming International Meet. "Standard protocol following such a review outcome is for Erraid to be seen again and arrangements are being made for this. 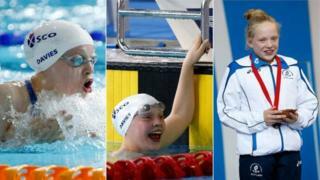 "While Erraid and her family are extremely upset and disappointed with the outcome, they welcome the opportunity of a second review and both Scottish Swimming and British Swimming are supporting them at this time."